Harting is meeting the I4.0 challenges of big data across smaller end points with the M8 D-Coded ethernet connector. Ethernet is becoming increasingly common as a communications standard within industrial automation. Where once, until relatively recently, it was reserved for the top levels of monitoring and control units, increasing numbers of sensor, camera and other industrial device manufacturers are looking to connect their products via Ethernet at the top field level. At the same time, field clients are becoming increasingly smaller, whilst being required to achieve even higher data transfer rates. In order to keep pace with changes within the connection technology arena, HARTING Technologiegruppe from Ostwestfalen-Lippe has recognised this trend in miniaturisation and has launched the new M8 D-coded connector in response, represented by the “Miss M8ty” character, HARTING’s smaller Ethernet heroine for applications from the Cloud right down to all sensors. Miniaturisation is affecting all electronic segments, not least in industrial automation where camera systems, sensors, switches, I/O boxes and decentralised industrial PCs amongst others are becoming continually smaller. However, it’s not just that the size of these devices is shrinking, they also have to satisfy the increased specifications of digitalisation and generate significantly more data than even just a couple of years ago. In the face of this, HARTING introduced Miss M8ty to the Hannover Messe trade fair this year with the mission of ensuring that the entire spectrum of industrial production, down to the very last machine, is connected to a suitable Ethernet network. Until now, it has been standard practice to enable device communication at the top field level via BUS systems. This required translating field level signals into control level Ethernet protocols and vice-versa. It is now possible to cut out this step and connect the new, miniaturised field clients directly via Ethernet. This results in higher data transfer rates, which require modified connector systems. What connector options for data transfer are actually open to customers? There are really only two IP67 protected methods to consider: an additional RJ45 protected in an enclosure, or an M12 pin connector. 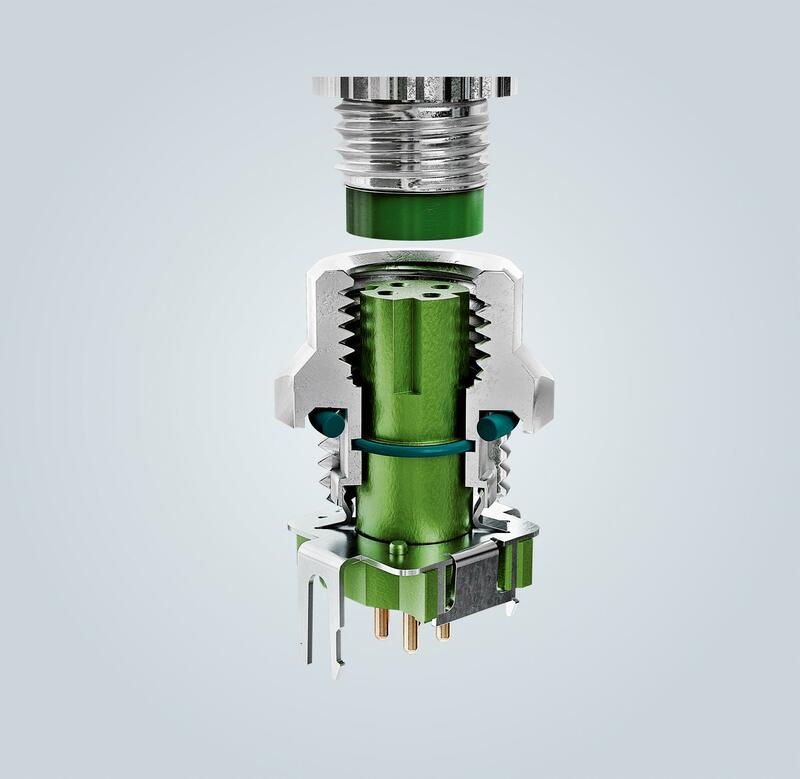 Despite being small, these connectors are now becoming too large for many applications. Here’s an example: some modern industrial cameras used for identification and positioning have grown so small that the power and data connectors are restricting the miniaturisation of their enclosures and actually take up most of the space in the application. M8 connectors are used in many applications at the field level, at least for signal forwarding. The new D-coded M8 connector features a strong metal enclosure with continuous shielding and 0.8 mm diameter contacts, which enable end devices to be supplied with 100 Mbit fast Ethernet. To avoid having to find extra space for the additional power ports, the D-coded M8 connector supports PoE and can feed field clients with power and data simultaneously. HMI, which was also the starting signal for mass production, was the showcase for a universal product consisting of extruded cables and circuit board connectors. This offers device manufacturers the right connector system to make the next steps in miniaturisation a reality. On the circuit board, the M8 is about 30 % smaller than the previous M12. Whilst that doesn’t sound like much, if you combine different M8 ports on an I/O box, the sum of the reduced modular spacing leads to dramatic space savings. On the device-side, users can choose between two flange sockets in heights of 9mm and 13mm. This allows other connectors of different heights to be used, eliminating the problems of differing distances. During the first stages, the M8 D-coded connector will receive the familiar threading used by pin connectors. However, as HARTING has good experience with a push-pull locking mechanism used on its larger M12 counterpart, the M8 will feature this fast and easy mechanism in the not too distant future. In particular, this offers easy access when connectors are arranged next to each other within a very confined space. The cable components of connector systems must also be modified. Therefore HARTING will release its own ad-hoc field assembly connector in the form of a displacement termination under the name HARAX. To ensure backward compatibility of the new version of the M8 as a universal product, the D-coded version is also standardised. A universal standard with a protocol in accordance with IEEE 802.3, and a connector designed according to the specifications of PAS IEC 61076-2-114, offers customers investment security and allow it to be used with existing active and passive infrastructure. This applies equally to the automation and transportation markets. Now take a step back and consider the entire system of industrial cabling from the outside. HARTING’s M8 is leading a new front in development, which was still completely unthinkable just a few years ago. Ethernet communication no longer just takes place between the top level of a company and field distributors. High-performance and appropriate miniaturisation mean that connector systems can expand networks both upwards and downwards. There is no more uncharted territory on the digital world map. Everything can, and will, be talking to each other in the near future. Servers, internal company networks, individual workstation PCs, network nodes, switches, machine modules, tools, even products will be communicating with their environment via RFID. And it’s miniaturised ports such as the M8 D-coded connector that are making this possible.